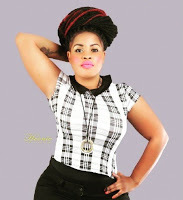 Kenya’s up and coming curvaceous socialite Bridget Achieng’ has recently been trying her best to out shine the big three: the bleached hot mama Vera Sidika, the scandalous Huddah Monroe alias the boss chick and the controversial well-endowed Corazon Kwamboka. She is actually doing what the three have done only that she is putting in more effort. She currently has 12,000 followers and counting on IG and she ain't stopping anytime soon.